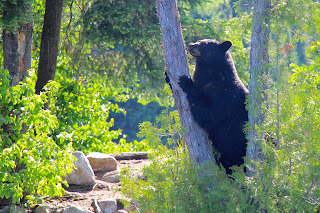 No trip to Errington’s Wilderness Island is complete without spending time at Bear Point to view bears. 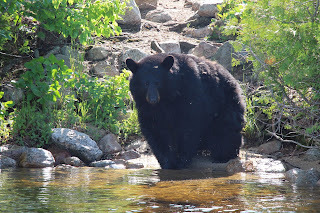 It is absolutely fascinating to watch bears and be able to photograph them at a safe distance in your boat. The resort composts food scraps at Bear Point. Bears show up on a fairly regular basis to chow on tasty treats. “Breakfast” is usually delivered to Bear Point between 9:00 and 10:00 am. My husband, George, and I arrived early one morning to view the compost delivery. As we approached Bear Point, we saw a bear patiently waiting for the food to be delivered. The bear may have thought we were the food truck, or food boat, as he decided to take a closer look. A short time later, Al and Larry brought the compost to deposit at Bear Point. A smaller bear was very eager to dive into the compost. 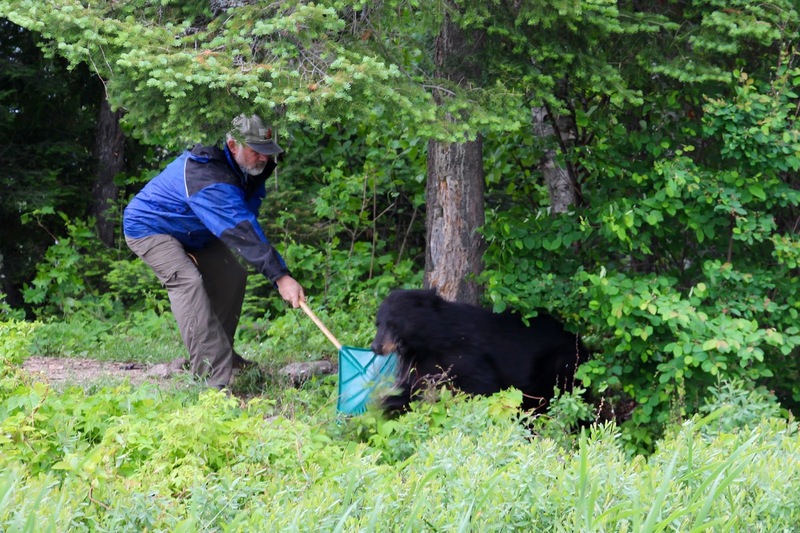 Larry tried to chase the bear away with a rake so the food could be deposited. The bear was determined not to loose the opportunity to be first in line for the goodies. Al then tried his hand at teaching the bear the proper behavior when food is delivered. The bear settled down and Larry and Al were able to dump the food and the bear dove into the food before they even were back into the boat. It was very exciting watching the event unfold before our very eyes. But from the looks of Al’s rake, he may need a new one for Christmas. Thank you for your comments. Al and Doris. Connect with us on our social media and share your photos or reviews. Al, Doris, Devin & Morgan Errington and their staff would like to welcome you to fly in to our secluded wilderness island lodge for Great Fishing, Wonderful Wildlife and Relaxing Wilderness Vacations in Northern Ontario Canada.